Not every piece of Ultron merchandise out is all about celebrating the Avenger’s most iconic villain heading to the big screen in Age of Ultron. Sometimes, the maniacal robot just gets a badass action figure because hey, he deserves it. You do you, Ultron. ThreeA have released a series of teaser images for a new Marvel figure designed by Ashley Wood — and although it’s perhaps not as wacky and radical as his sublime Iron Man figures, it’s a pretty great update that blends new elements with the classic look of Comic Book Ultron. The plated armour look, the gaping permanent smile, the rivets on the hands and head, these are all classic throwbacks to some of Ultron’s earliest designs. But they’re all modernised in such a way that it looks like a brand new Ultron for 2015. Honestly, I think I actually like it a little more than the eerie Ultimate Ultron movie design. It’s hard to tell, but it looks like Wood’s Ultron will have light up elements in the eyes and chest areas (I hope they’re red), but we know at least that it’ll also come in three flavours: Classic, Shadow and Ghost editions. 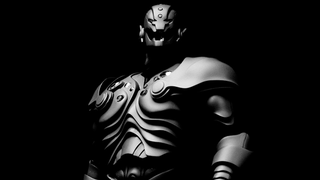 It doesn’t seem to be the case, but I kinda hope the mouth area glows a flickery red like the old Ultron designs. Hard to pull off but it would be a lovely touch. ThreeA’s Ultron figure will go up for pre-order on May 7th.